10 days from £7595pp plus international flights. This is a real adventure into the wild! 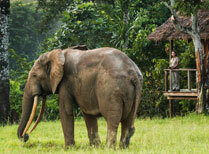 It gives you the rare chance to spend time in the Congo rainforest, the second largest in the world, with its varied habitats and rich wildlife. While the charismatic western lowland gorilla is the undoubted star, the mysterious 'bais' with their mineral-rich waters attract forest buffalos, elephants, sitatunga and flocks of parrots plus many other species. Odzala-Kokoua National Park in the Republic of Congo is a remote and vast tract of the globally-important Congo Basin rainforest. With the largest concentration of western lowland gorillas in Africa, a high density of forest elephants, plus chimpanzees (rarely seen) and other primates, predators such as spotted hyenas and serval, in fact over 100 mammal species, and a rich birdlife, this is a hugely special forest reserve. One of the key features of Odzala are the bais (or salines). These are like swampy tree-less grassy islands in an ocean of forest. They attract the wildlife who come to drink, eat grass, and ingest the minerals and salts found here. Forest elephants particularly love these forest oases. 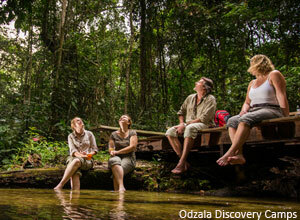 Your time in Odzala will be divided between three camps in different areas, each with its own specialities. 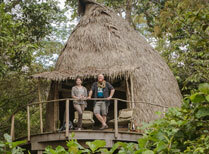 At Ngaga Camp you'll concentrate on tracking the western lowland gorilla, led by a professional guide and local tracker. You have two chances to trek, though a third is possible (at extra cost), and should you wish longer here you can discuss a slightly different itinerary with us. From Ngaga you can also visit Ombo village to find out something of the lie of the people who live in this vast forest. At Mboko Camp, the largest 12-room camp set along the Lekoli River, you go for walks in the forest, as well as boating trips. The activities at Lango Camp are similar to those at Mboko - you'll be able to take leisurely pirogue rides on the river, drive into the savannah and go for walks by the bai. Some of these activities can involved wading through streams and bais, and patiently waiting to see the forest wildlife. We've left you valuable time to relax, too. You'll have your own en-suite room with a broad veranda, ideal for quiet downtime. All three camps have lovely, high-ceilinged lounges where you can sit back among the cushions, sip a chilled drink and chat to other guests. 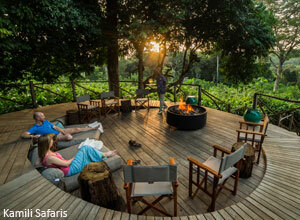 Each has a large viewing deck centred round a fire, the place to unwind at the end day, enjoying the company of your new friends and gazing at the star-filled African sky. We make every effort to get you to see as much wildlife as possible, though we cannot guarantee any sighting (including the gorillas). 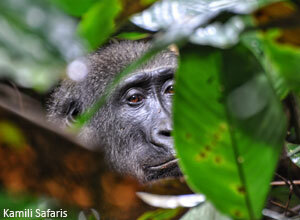 Western lowland gorillas - there are 2 habituated groups. Other primates - crowned monkey, moustached monkey, black and white colobus, grey-cheeked mangabey, putty-nosed mangabey. Other mammals - forest duikers, forest buffalo, harnessed bushbuck, forest elephant, spotted hyena, bongo, red river hog, western sitatunga. Birds - African grey parrot, green pigeon, great blue turaco, blue-casqued wattled hornbill. 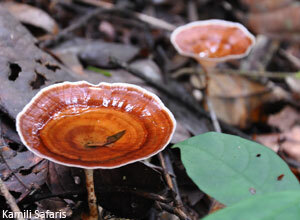 You should be aware that this is a really remote area and a full-on rainforest experience. If you don't like bugs, like your camps to be run with perfection, and can't cope with getting wet and dirty, Odzala is not for you. If, on the other hand, you want to see a really remote part of Africa, you have a flexible attitude and can take things as they come, can enjoy the challenges that nature throws at you, and can deal with bugs of all kinds, don't hesitate! This is a supremely special wildlife and wilderness experience that a tiny number of people each year will be fortunate enough to experience. A trip is guaranteed with 2 people, and maximum of 10 can travel. Two gorilla treks are included, though a third is possible at extra cost. If you prefer to have your camps in the following order - 3 nights Ngaga, 2 nights Lango and 2 nights Mboko - this is also possible. This itinerary shown is suggestion of how the week would work, but it might not be exactly as described. Your flight lands at Maya Maya international airport in Brazzaville, where a representative is waiting to welcome you to Congo and drive you the short distance to the Radisson Blu M'Bamou Palace Hotel. Nothing has been arranged for the rest of the day, so your time is your own to relax after your journey and enjoy the facilities of the hotel, which include an outdoor pool, a gym and 3 restaurants. 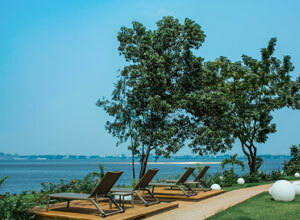 Sitting on the terrace or in the gardens you can take in views of downtown Brazzaville, the Congo River and Kinshasha on the other bank, as you look forward to the safari in the days to come. Dinner on own account. Today you have a relaxed start to the morning, or you can choose to have either another gorilla trek (not included in the price, but permits are for sale in advance of your arrival or in camp subject to availability). Later that morning we drive you to the next camp, Mboko, via Ombo village to see something of local life. The journey is about 3 hours and we have lunch at Mboko. The afternoon's activity is a river cruise on the Lekoli River. Sit back and enjoy the views. With luck you should spot some of the resident wildlife such as forest elephant, buffalo and, with luck, the shy sitatunga. There are certain to be plenty of monkeys, too. We'll have sundowners before returning to camp. Full board. During breakfast at Mboko Camp you should keep your eyes open for Ferdie, a forest buffalo and frequent visitor to the camp. Then it's time to take to the water in a kayak. 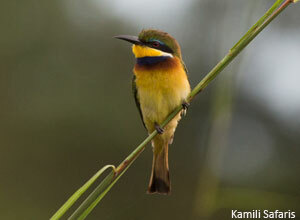 Your route is along the Lekoli River and ends at Lango Bai where there are often animals to be seen including monkeys, frogs, birds and insects. 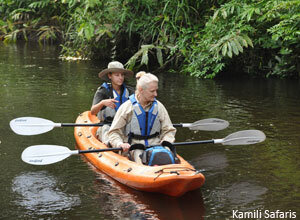 This is a lovely way to explore, paddling at your own pace, pausing to watch wildlife, and immersing yourself in nature. At the bai you can get out and explore on foot, before heading to Lango Camp for lunch. Fully refreshed, you set out on a late afternoon walk in the rainforest, following one of the many trails created by the forest elephants. Back in camp you join other guests by the campfire for drinks, and then enjoy a 3 course dinner. Full board. You are woken for breakfast after which you have time to pack your bags in preparation for the jouney back to Brazzaville. This begins with a drive to the airstrip where you board the flight to the capital, and from there onwards to home. Breakfast. 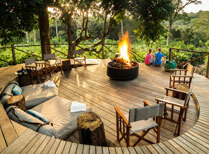 Price notes: 2019/2020 rates based on 2 people travelling from 1 Jan 2019 to 31 Mar 2020.
International flights and taxes; visas; travel insurance; meals not specified as included; drinks at the Radisson Blu; tips (we recommend US$250 per guest for a 7 night safari); items of a personal nature. This holiday starts and ends in Brazzaville. Return flights from the UK are priced at around £900-1100 per person, depending on season and availability. 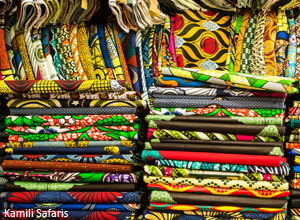 Air France via Paris and Kenya Airways via Nairobi are usually the best options for anyone flying from Europe. Please note that due to timings an overnight in Paris is sometimes required on the Air France routing. For the rates quoted, the trip must begin on a Sunday or Wednesday, as the Brazzaville-Odzala scheduled flight goes on a Monday and a Thursday. 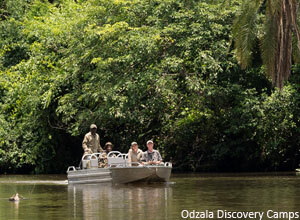 Odzala-Kokoua National Park in Congo’s remote north-west is one of Africa’s oldest national parks. 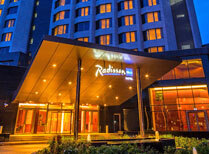 A modern, high rise hotel in downtown Brazzaville on the banks of the Congo River and just 6kms from the international airport.